One of my all-time favorite Disney animated movies is “Meet the Robinsons.” Customs featuring that movie are far and few between. So when a friend of mine sent me a picture from an artist on Etsy with the following custom… I had to contact her. Stephanie Cassata from Anamosa, Iowa is the subject of our spotlight today. 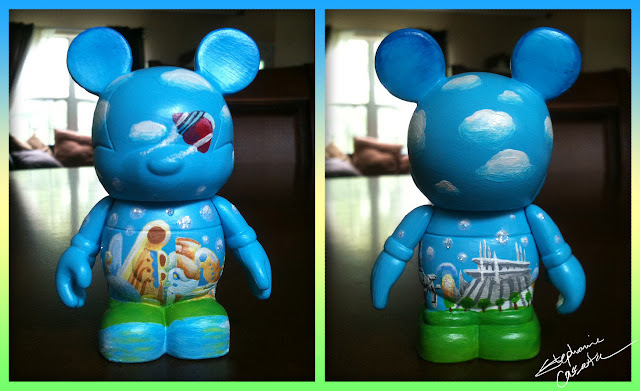 She has also designed one of the sweetest Vinylmation 95s I have ever seen. 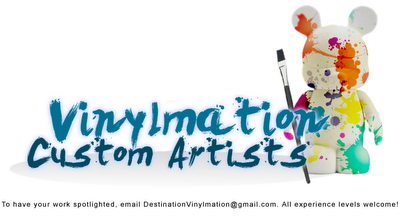 Destination Vinylmation: We don’t see too many “Meet the Robinsons” customs, what made you choose this movie ? Stephanie Cassata: I love the movie “Meet the Robinsons”, not only is it hilarious, but touching and inspiring too. “Keep moving forward” is a quote that is so important to remember. The scene depicted here is a very exciting one where Wilbur takes Louis to the future. The fantastic scenery paired with the soaring score makes this one of my favorite scenes in the film. I really enjoy the retro style of the future, which is another fun aspect of the movie. And with “Tomorrowland” becoming “Todayland”, truly is the cherry on top of this moment. DV: You also have a custom that looks straight out of Disney’s Cutesters series. 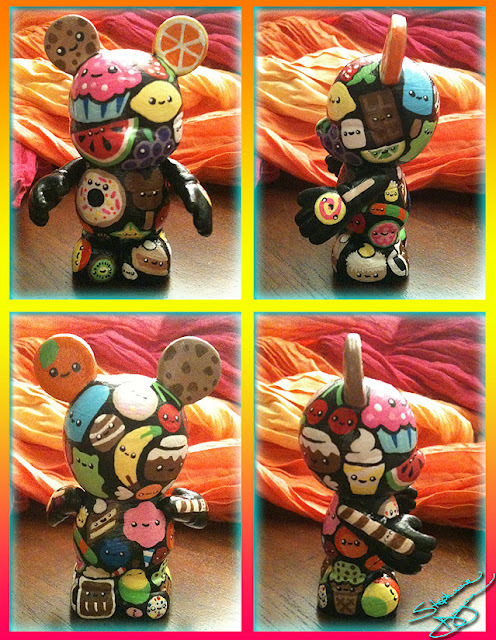 Your 3″ Kawaii Custom features all kinds of treats including some Disney themed ones. I spot the Mickey ice cream bar… what else is in there? SC: There is a Dole Whip on the right side of the face, school bread on the side of the left foot (found in the Norway pavilion at Epcot, which by the way is delicious! ), and the blue popsicle on the back of the head is a nod to the amazing Kingdom Hearts games. DV: You custom painted a Vinylmation 95 to look like a Sugar Rush Racer from Wreck-it-Ralph. This was a brilliant idea! First off… is it edible? SC: Thank you! It certainly looks good enough to eat! 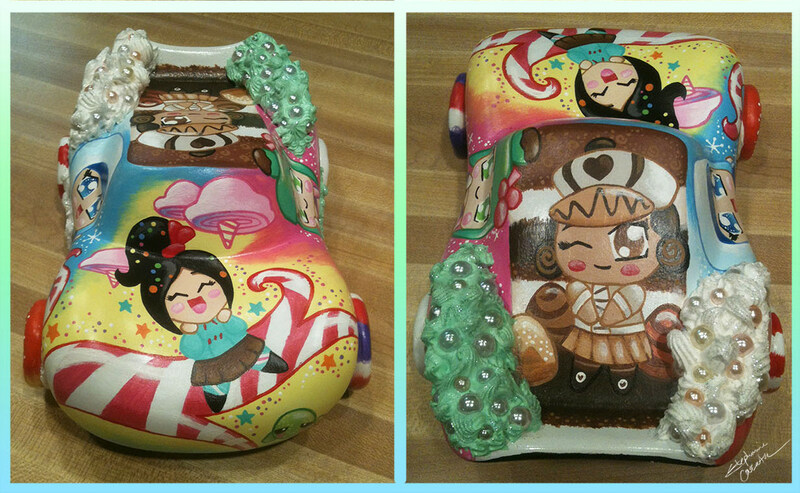 My aim was to make it as sugary sweet as I could, from the bright colors to the sparkling details. I knew the wheels had to have candy rims, and I had a lot of fun adding the “frosting” to top it off (which is actually Whipple applied using actual frosting tips). This custom does make me hungry for some cake! DV: The wheels are my favorite part. What is yours? SC: I think I’d have to say the front-right area is what makes me smile the most. Something about the colors all coming together at the point is just beautiful. The peach ring with the peppermint swirls, the blue merging into the yellow, and the sprinkle/stars are very aesthetically pleasing together. DV: Where can people go to view and purchase your work? DV: Do you take commissions? SC: Indeed I do! I love to work with others to create the customs they would love to see come to life. I can be contacted through my Etsy, website, or straight through my email [email protected] with any inquiries, questions, and commissions. DV Thank you for sharing your work with our audience. SC: My pleasure! Thank you for the spotlight, it really is a treat to share my passion with the world and the fantastic Vinylmation community.